Héctor Palacios was released from prison on Wednesday, Dec. 6, 2006. "(F)ighting for what is just is the only way to experience happiness." — Héctor Palacios Ruíz, May 2003, in letter from prison to his wife, Gisela Delgado Sablón. 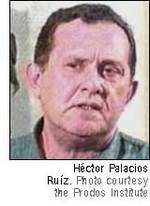 Héctor Palacios Ruíz, 63, was arrested during the Black Spring crackdown of March-April 2003 and sentenced to 25 years in prison, for his opposition to the Castro regime. However, he has not let his imprisonment silence him, reporting from prison about the abuses suffered by him and other prisoners of conscience. A former official of the Communist Party, Palacios broke with the regime in 1980 — the year of the Mariel boatlift — over its treatment of Cubans who wanted to leave the country. An economist and political scientist, Palacios would go on to start and/or lead various opposition groups, including the Cuba Libre Radical and Democratic Movement; the Democratic Solidarity Party; Todos Unidos ("All United"), a coalition of opposition groups; and the Varela Project. He also has worked as a journalist and independent librarian. Prior to March 2003, Palacios had been arrested numerous times. He was arrested in 1994 during a protest following the attempted hijacking of local ferries from Cuba’s coast. Mr. Palacios was subsequently jailed in 1997 for “disrespecting” the Cuban government during an interview with a German television station. In 2000, Mr. Palacios and Mr. Oswaldo Payá Sardiñas were detained for drawing international attention to the human rights situation in Cuba by meeting with heads of states during the Ibero-American Summit in Havana. Like other political prisoners, Palacios' health has deteriorated while in Castro's gulag. To read more about Palacios, in Spanish, visit Payolibre. 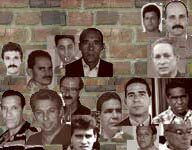 One of the surest indicators of the repressive nature of the Castro regime is the jailing of more than 300 political prisoners. To illustrate that reality, Uncommon Sense each week will profile one prisoner, and keep that post at the top of the page from Sunday night through Friday morning. (That may change depending on the news of the day.) There also will be a Political Prisoner archive on the left sidebar. To suggest a prisoner for a profile, send me an e-mail.